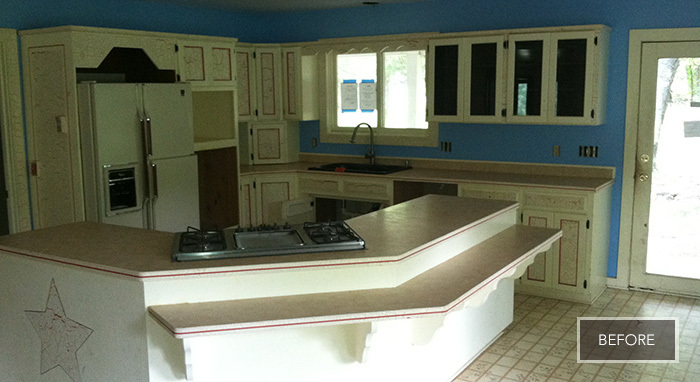 When kitchen designer Laurel and her husband purchased their house less than a year ago, her designer eye could imagine past the existing dingy, outdated kitchen to its real potential for becoming the heartbeat of their home. "I wanted something classic that would last," she said, so they decided to create one large, open-concept kitchen-and-dining space for cooking gourmet meals, eating together as a family, and entertaining close friends. Laurel selected beautiful hardwood flooring to flow all the way through the whole room for a unifying effect. 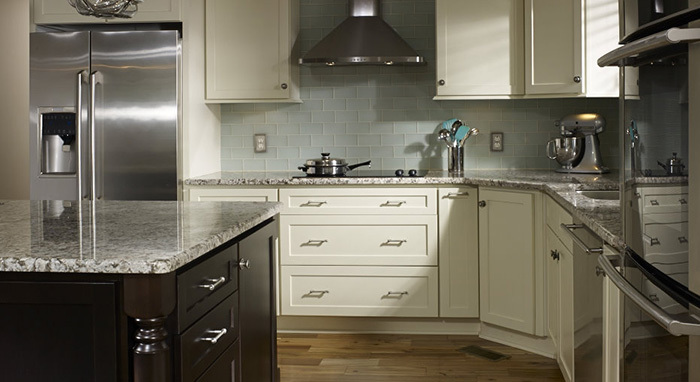 She also used the same neutral color palette repeating calm gray, beige, and chocolate hues in each area, including the cabinetry, counters and wall paint colors. 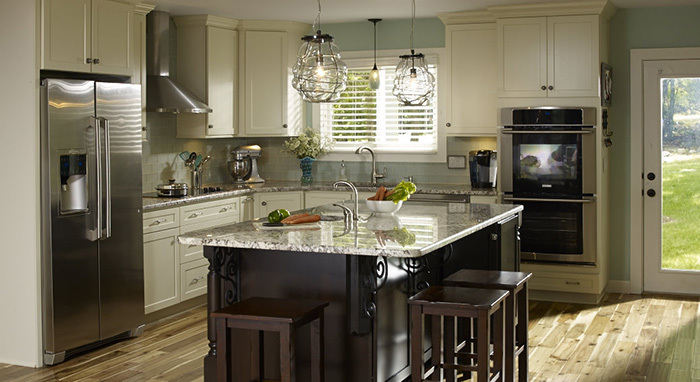 Laurel’s advice to other homeowners considering a remodeling project, whether a kitchen remodel or any other room in the house, is to start by looking through magazines and develop a vision for the entire home. In the kitchen, Laurel chose Homecrest cabinets in the Sedona cabinet door style with an Ivory finish for its clean lines and great storage options. 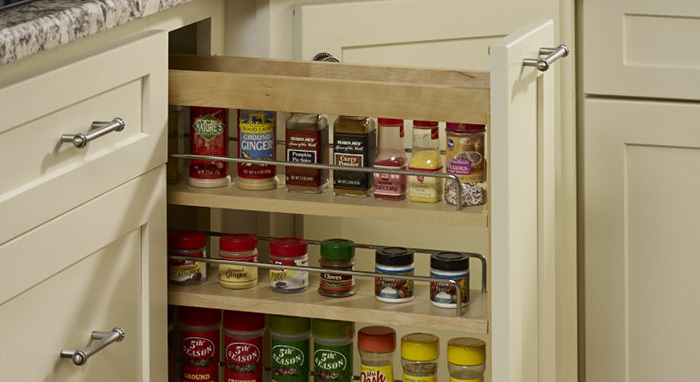 A pull-out spice rack near the cooktop keeps the assortment of spice containers tidy and close at hand. 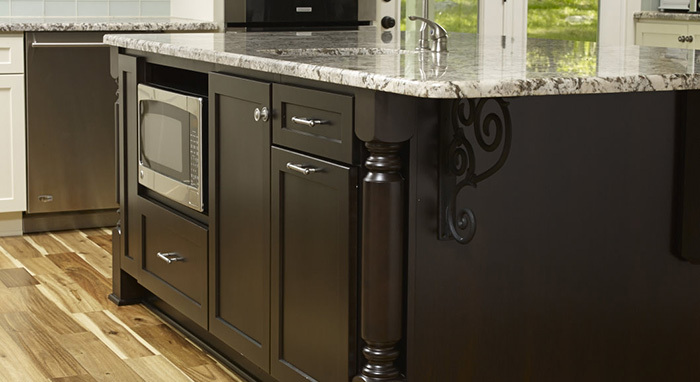 Roll trays in the base cabinets help pots and pans to stay organized, and tall 39" wall cabinets offer extra room for storing away serving trays and extra coffee mugs. The large kitchen island in a dramatic Java-colored stain is the showpiece of the kitchen though, with gorgeous pendant lights inviting family and friends to gather around it.